[company]Dish[/company] is leasing the PCS spectrum it acquired at auction last year to Artemis so it can install its transmitters on San Francisco rooftops by wireless ISP Webpass. Once it’s complete, which according to Perlman could be as soon as this fall, it will sell unlimited 4G data and voice-over-LTE plans to consumers via SIM cards that they can plug into any iPhone 6 and 6 Plus as well as select Android handsets. pCell flies in the face of a decade of cellular networking wisdom, which states that mobile data networking technologies improve only incrementally. The progression from 2G to 3G to 4G has been about squeezing more bits per second into a hertz of spectrum, but even crossing the single bit-per-hertz threshold was a hard-fought gain. Now Artemis claims it can improve that spectral efficiency by a factor of 35 by replacing big tower-mounted macrocells with a dense layer of pCells distributed throughout a city. While devices normally have to share the available capacity of the network, Artemis claims its technology will deliver the theoretical maximum speed to every device it connects to, no matter how many smartphones or tablets are competing for attention. Artemis has demonstrated this by placing dozens of iPhones side by side all streaming different videos over the same spectrum, something that would be nearly impossible on standard LTE networks. pCell accomplishes this by turning the topology of cellular networks inside out. Typically, cells are deployed in a manner that avoids interference. A transmitter sits in the center of a cell and neighboring cells are spaced far enough apart that their signals don’t interfere with one another. We, the users, move throughout these generally interference-free zones and expect to always find a clear signal. Artemis, however, isn’t creating a grid of non-interfering cells. It’s throwing its signals straight at one another, creating a network where the vast majority of physical space contains a miasma of cross-interfering airwaves. But according to Perlman, there is order in that chaos. 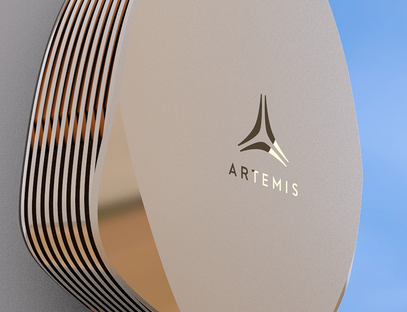 Artemis is really shaping the radio airwaves to create tiny oases of pristine signal reception — the pCells themselves — which just happen to be centered on wherever our devices are in the network. It’s a hard concept to wrap your mind around, but it helps if you think of the network like a pond and each transmitter like a pebble. A pebble dropped into the pond creates ripples, or waves, that radiate outward, much like a cell tower transmits today. If you throw a bunch of pebbles into the pond, the crossing ripples create new, more complex patterns. If you were to drop thousands of pebbles at precise intervals and at specific places into that pond, you could shape those patterns into very intricate shapes. That’s what Perlman claims his pCells can do: paint the Mona Lisa in the airwaves with crisscrossing transmissions. Instead of the perfect smile, though, pCells are really crafting three-dimensional cells that can follow any device through the network. Perlman said he’s taken those criticisms to heart, and Artemis is now taking a series of steps to quell that skepticism. Artemis is releasing a detailed technical white paper this week that Perlman said will answer many of the remaining questions about pCell technology, but most importantly, Artemis will show by doing, Perlman said. The San Francisco network will let anyone willing to slot an Artemis SIM card into their phone test the technology for themselves, Perlman said. Furthermore, Artemis is performing a more intimate pCell trial in Santa Clara’s Levi’s Stadium with VentureNext to test out the technology in heavily trafficked indoor areas. Finally, it’s releasing its first commercial product, called the Artemis I Hub, to carriers to test pCells in their own networks. Perlman said he believes all of these efforts will provide both the science and the empirical data to convince pCell’s doubters of the technology’s merits. As for the San Francisco network, Artemis still has to jump through some hoops to bring it online. Perlman said he wants to offer a full-fledged mobile service that SF residents can use to replace their regular carriers. That means Artemis will have to build a network comprised of thousands of pWaves (its pCell transmitters) on Webpass’s 600 rooftops scattered throughout the city. Artemis also has to build the core infrastructure to support a VoLTE service so its customers can make phone calls and send text messages. And it needs to strike a mobile virtual network operator (MVNO) deal with a nationwide mobile carrier so its customers can roam outside of the city limits. Finally, Artemis needs to get Federal Communications Commission approval for the project. If all goes according to plan, Artemis could start selling SIM cards this fall, though delays might push it to the end of the year or into next year, Perlman said. I am looking forward to trying out this network for myself. My only issue with the demonstration you had was it was all the same phone… not to mention iphones. are you afraid of the compatibility when it comes to android tech? I think a range of notes, mini tabs, tabs, and cells of all varying degrees might give a better demonstration. But maybe you have thought of that already. Pcell is compatible with but NOT LTE! Thanks Paul Lucero, for the clarification, as I thought it was a layer over LTE, but then again not being a technical person I misunderstood what it says in the article. how about launching 50 geostationary satellites and service the whole country with higher latency 4Gor5G/Artemis Internet or 10,000 drones to service nation with lower latency 4Gor5G/Artemis mobile phones. PCell is a cheap opportunist system that out performs all planned system! Lol. Only indoor tests with static devices in a uniform grid disposition? Not to mention the humongous real-time processing power needed for channel estimation on this distributed MIMO system. This is not a Grid system! I’m not a cellular tech expert, but I will pretend to be one now. Does a SF only network really prove the viability of the system? What about suburban and rural areas? Can it handle heavy use that an AT&T for example experiences in major cities? I hope the answer to all of these questions is yes, it works better than what we have now, otherwise I don’t artemis having much of a future. The simple answer is with a pcell on top of a fiber connection you can even get 4K video on every cell phone that can process it in the city! given the density of pCells that are needed, the tech seems to be most appropriate for a constrained area – like a stadium for example. but why would you choose broadband cellular tech in a constrained area over other alternatives? even if you can deploy a high density network of these pCells in an area, you still need the backhaul connectivity too. Otherwise all pCell devices would be able to do is connect to each other. Google fiber and many others provide back haul everywhere in most major cities. Even along the hwy routes fiber trunks are sitting though out many states! How about putting one of those units on every dish rooftop in the U.S. Now theres a network! Sign me up. This is NOT a cell based system! Apple should buy them pronto. Yeah… how about a company buy it that is not known for outrageously overpricing their products instead. Apple would sell bottled water for $400/bottle if they could. They aren’t overpriced if people are willing to pay for it. That is the law of economics. If everyone stopped buying Apple products, then they would be overpriced. If apple stopped winning every single phone comparison when they are released year after year then maybe you would have a point, but you don’t. Try as you must to hate on Apple, they have consistently put out the best product. Them buying Artemis would send shockwaves through the industry. It would take 10’s of billions to get national coverage, but there wouldn’t be a single other competitor worth looking at. And please don’t say apple would charge a whole bunch for it, they would price it into the cost of their phones. Add $100 to each handset and that would cover their expenses, make a profit, and not be too expensive for people to buy. I would pay an extra $100 to have speeds theoretically 35x current lte (it didn’t mention exact speeds but it did say increase spectral efficiency by 35x, whether those two directly correlate I don’t now know). Everyone would sell bottled water for $400/bottle if they could. Why wouldn’t you? If people were willing to pay for it. Your and everyone else who blindly hates Apple really need to understand that its a company that has continually dominated the market by producing market leading and market creating products. Yes they charge a lot, but everyone is buying them at record levels. If pcell were as implemented as LTE, it would drive prices down. Think about a iPod touch vs an iPhone. Cheaper, thinner, and if made with comparable hardware, faster. Pcell doesn’t need a LTE modem, it could WiFi just the same. Steve the CEO used to work with me at Apple ATG in 1990’s. He will not sell them anything he is a billionaire!